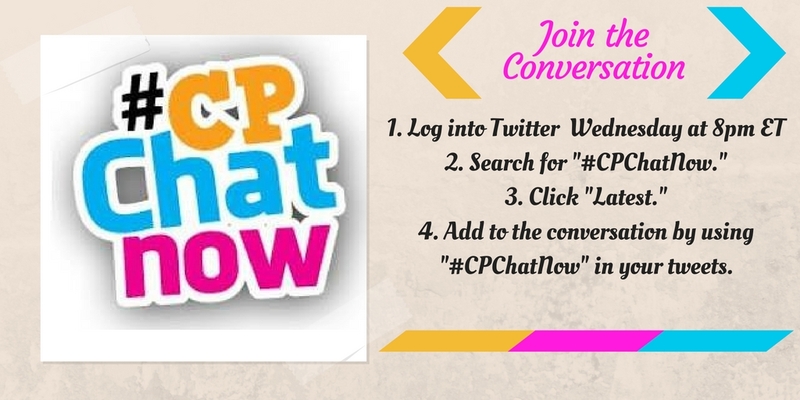 Wednesday, March 15th, 2017 saw a well-needed #CPChatNow Twitter chat. 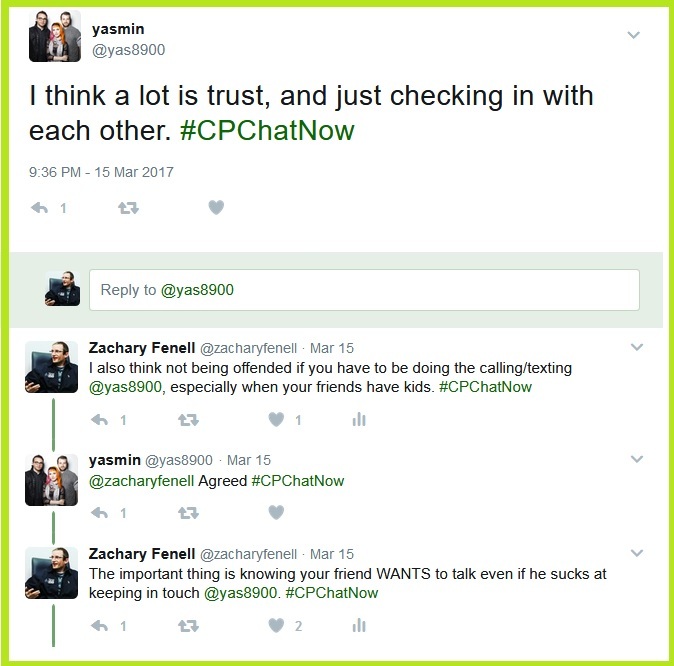 I am co-host Zachary Fenell, here to document the chat for the history books. Or, at least recap the evening discussion for our website’s archives. The evening began on a happy note, with some familiar faces returning following MIA status. Unfortunately, the joyful vibes hit some turbulence. 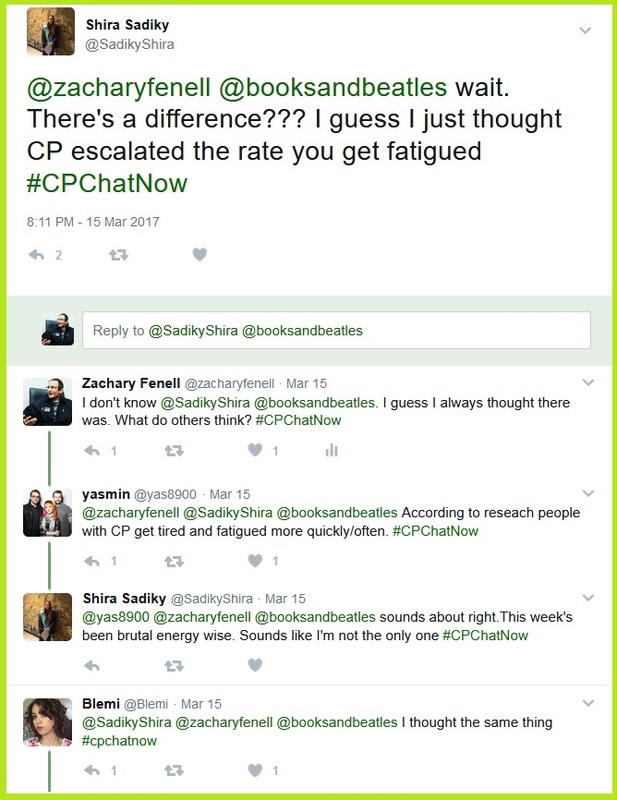 Like the above screen shot shows Jocelyn’s appearance coincided with a rough week for her. Although Jocelyn proved not the only one. Many seemed in-midst a tough week. 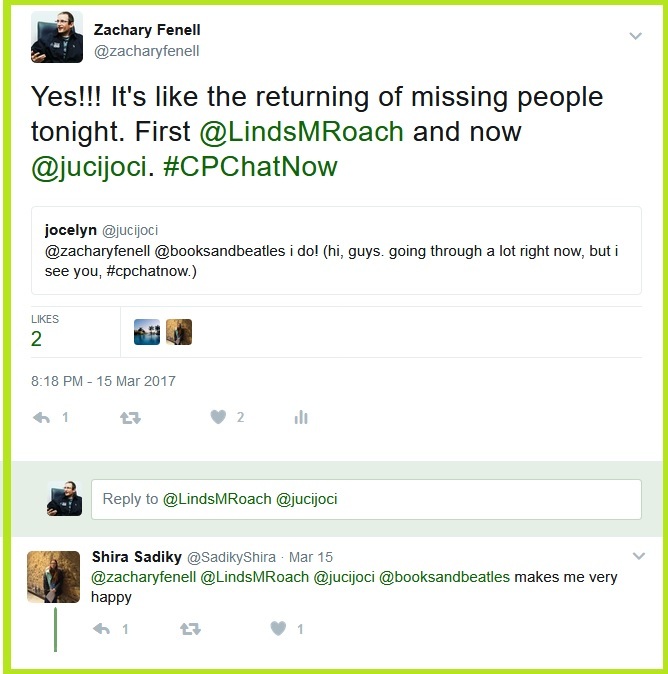 Hence the reason I described the chat earlier as “well-needed.” Possessing a community to confide in remains extremely beneficial. 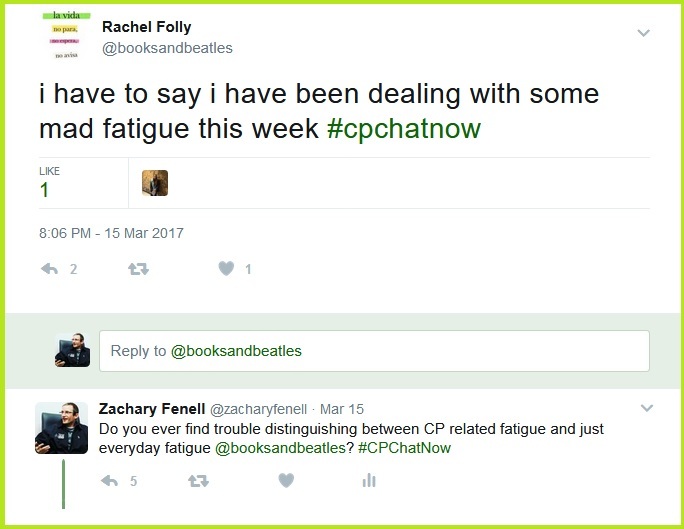 Now my response asking about a difference between CP related fatigue and everyday fatigue sparked some chatter. Specifically, whether there actually exists a difference. Looking to expand beyond troubles to solutions, I asked how others cheer themselves up when facing hard times. 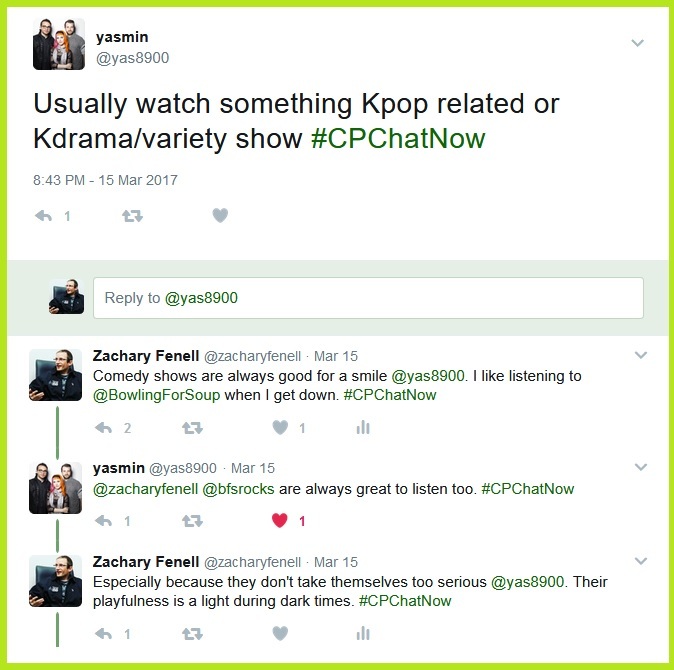 Jocelyn’s response in-part segued the conversation to another topic, friendships. More precisely how to maintain strong friendships while the years progress on. So staying friends when living in different states and starting families. You know, those adult life related issues! 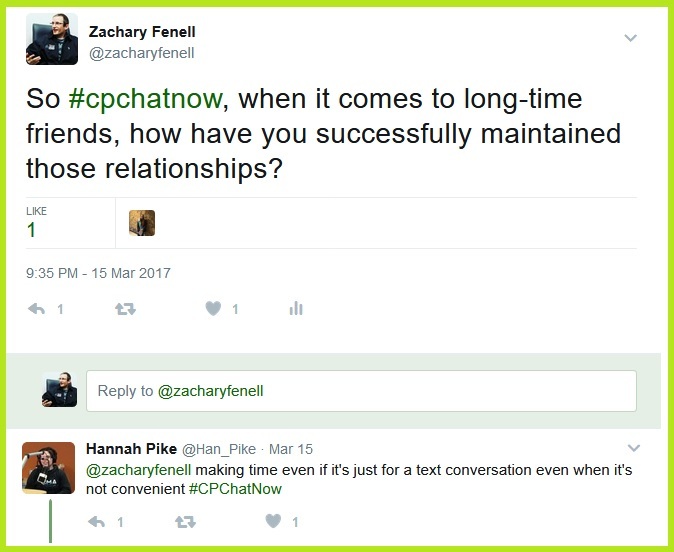 #CPChatNow regular Hannah Pike identified making time as an important task. Yasmin meanwhile spoke about trust. How about we keep the dialogue going? 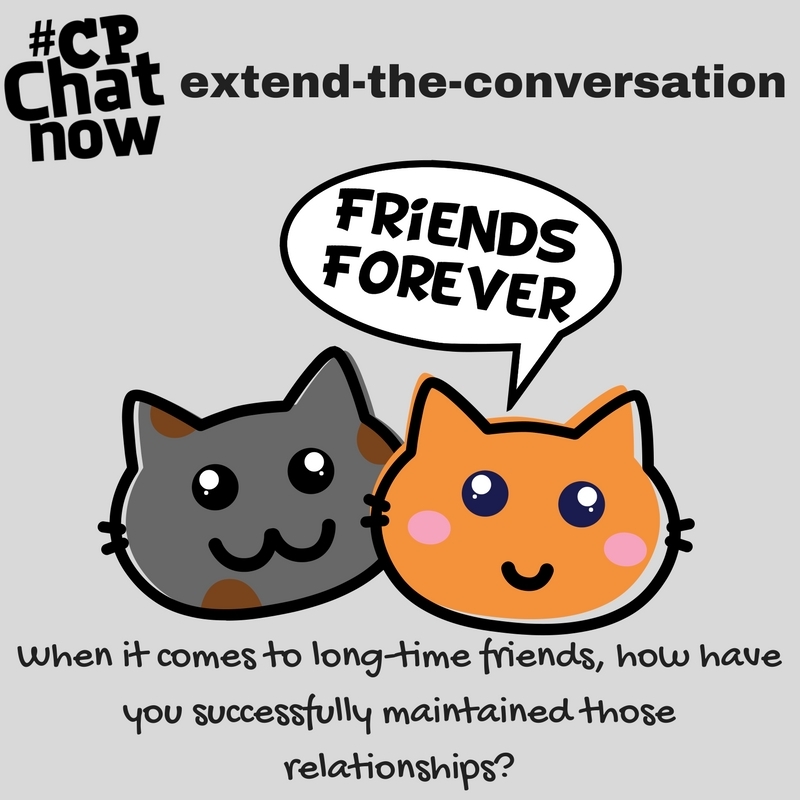 Answer for the week’s extend-the-conversation question “When it comes to long-time friends, how have you successfully maintained those relationships?” Reply in the “Comments” section. 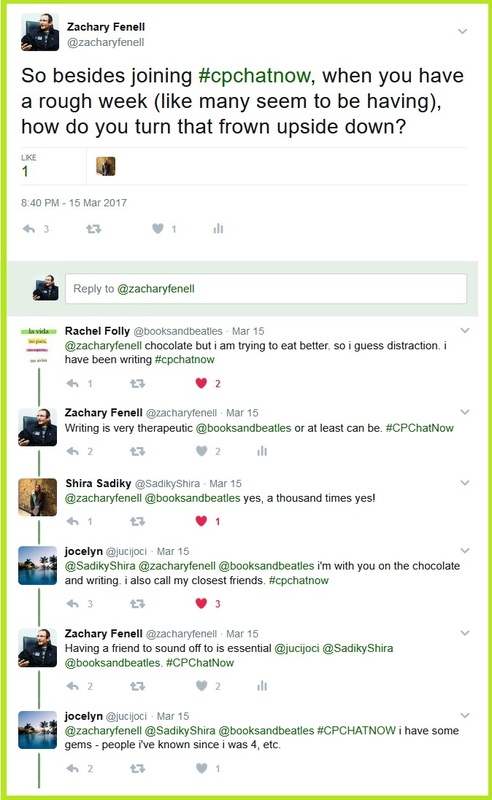 Also during the night I announced our March 2017 Google Hangout date. 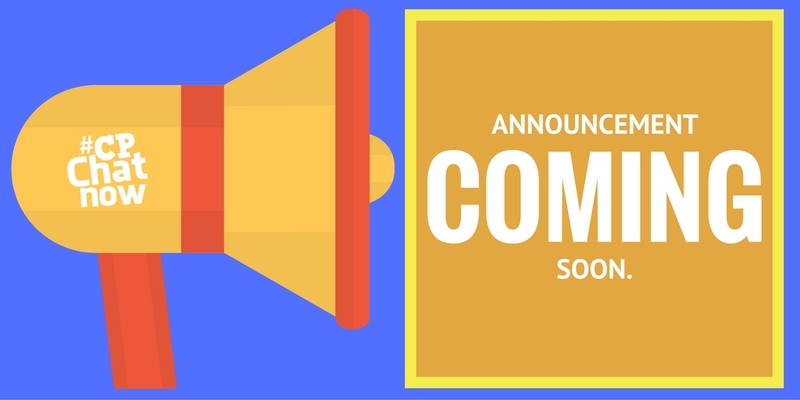 I hope you will join us Thursday, March 30th for our March 2017 Google Hangout. With no character limits, the video chat always provides an opportunity to delve into deeper conversations. Please contact interim co-host Devin Axtman or myself with any questions about joining. Additionally remember to answer the week’s extend-the-conversation question. When it comes to long-time friends, how have you successfully maintained those relationships? This entry was posted in Weekly Recaps and tagged friends, friendship. Bookmark the permalink.